Discussion in '2007 - 2010 Explorer Sport Trac' started by Flatwatr, February 22, 2019. Mine started out shuddering occasionally then after a year or so it would consistently do it while driving up a sloped grade/hill while maintaining 40-45 MPH. One way you can tell if it’s the torture converter is to disengage the OD and see if it still shudders. It should not shudder with the OD disengaged. If it does then it is not the converter. I don’t believe that the filter alone would cause that. I bet servicing it with Amsoil along with a flush and new filter would correct it. I read too much CON in a flush on high mileage trans. it concerns me. Although done at 53K, (2008), I had a trans fluid flush on a 93 F150, I let set with little to no use over 4 years. It did more harm than good. Mine does exactly as OP says; from about 30-50mph, just cruising along on a flat road with very light throttle input, the converter will lock and unlock constantly, except it locks smoothly. Doesn't shudder. If you start to go up a hill it will then shudder some when it locks. The shuddering worsens as load increases until it drops out of OD. I'm not too big on transmission flushes, especially on higher mileage units. I think a simple drain/fill is sufficient. A trick to fix converter shudder on 4R70/4R75 transmissions is to put a small bottle of limited slip differential friction modifier into the fluid. Curious if this would work on the 6R. As suggested by the Dealership, Rear shaft assembly replaced for the worn center carrier bearing, didn't help. Replaced four of oldest 6 out of 8 coils (Yea, not a very scientific approach; it's all the parts store had in stock), didn't help. Did seem to shift where in the RPM the shutter occurred. Had the Tans fluid and filter replaced (No Flush), the shutter is gone. But the pulsing surge all be it minute, is still there. So the conditions remain the same: 6th gear, 1000 to 1500 RPM, slightest pressure on the accelerator, just short of a down-shift the RPM jumps just slightly accompanied by a slight acceleration. If the RPM increases as with a down shift, it goes away. At highway speeds anywhere above 1500 RPM, it doesn't happen. I was able to find this thread about this issue. This guy, @PotatoExplorer, was able to (finally) fix this issue by replacing the TPS, after no luck trying many of the commonly recommended fixes such as coils, spark plugs, and transmission flushes. Vehicle surging with shudder/maybe torque converter clutch? Also this thread, by the same user, detailing another issue and trouble code also related to the TPS. My Mounty has a stored P1xxx code, but my obdii app won't tell me the rest of the code unless I buy the ford add-on package or whatever. Curious what that code is. I need to get Forscan. I want something that will allow me to see if the computer is locking and unlocking the converter constantly when this is happening, or if it isn't and its a tc/valve body issue. These 6Rs sure are strange beasts. Downloaded FORScan and investigated this issue further. PIDs to pay attention to here are APP1 %, TCC amp., ABSL rpm, and TP %. TCC: Torque Converter Control solenoid. TP: Throttle position, measured by the TPS at the throttle body. You can see the torque converter slip rpm jump up to above 150 from near 0, then back down to near 0 as the torque converter locks and unlocks. Take note of the TP% and APP% at these points. Notice that there isn't any change in either of the readings which consistently coincides with the TCC activity. Now take note of the TCC Apply servo amperage. According to this Sonnax Article, "The TCC solenoid is a normally vented or normally open solenoid. As amperage increases, TCC apply increases and WK pressure drops." 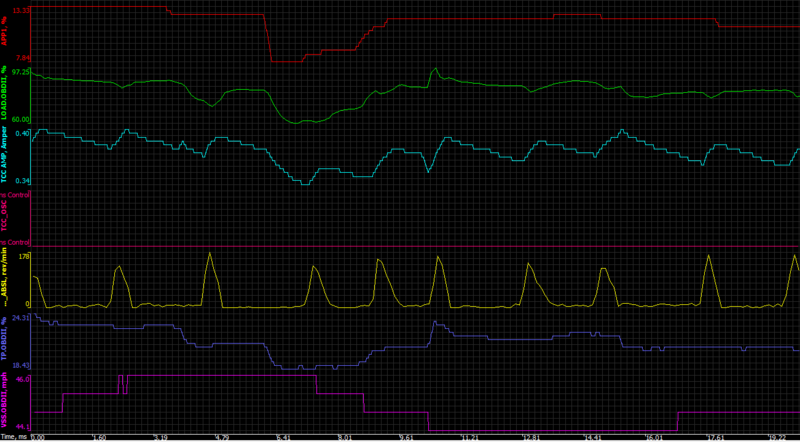 It seems to slowly decrease until the torque converter unlocks, then quickly increases to reapply the TCC. It seems it can be confirmed the locking/unlocking is being commanded by the computer, but I'm not sure why. The TCC will vary pressure to allow very slight amounts of slip to reduce NVH, maybe worn components somewhere cause this to fully unlock the TC when the computer is only intending to slip it slightly. I can't be sure. The TC was also shuddering like hell when this was happening, which tends to happen after you've been running it hard, which I had been doing. I want to look at these same parameters while the TC is locking smoothly, as it is 95% of the time, to see if anything is different. I want to physically monitor the fluid pressure with a gauge as well. Not sure why the calculated load % is so high, I was cruising along on a flat road with minimal throttle input, as you can see. Also the P1xxx code I mentioned in my last post was cleared when I reset the PCM and hasn't returned, so the jury is still out on what that is. Only trouble code on any of the modules is P0420, which isn't related. Probably. I must add that I'm very impressed with FORScan. Quite capable, easy to use, free software. Well here's a curious thing. I swapped out the stock exhaust for a Magnaflow catback last weekend, and ever since, the truck runs much smoother, and I have not had the rumble strip effect since then. So trans fluid and filter fixed the shudder? The slight jump your describing is the torque converter unlocking in 6th gear trying to avoid downshifting. It does it even when there's not anywhere near enough load on it to cause it to downshift. You can see it in the data logs I posted above. Minimal throttle input. I'd also really like to get ahold of a volume of factory service manuals. The obd/powertrain diagnostics volume of the service manuals for my '97 Yukon had tables that showed the normal values for all of the sensors and such on a properly working vehicle during different conditions. Was very handy. Following your advice, I had the transmission fluid and filter changed, with instructions, not to flush the system. The shudder is as good as gone, (no sound or tremble) but I could still see the slight pulse in RPM in the tac, again occurring at that same point (between 1k and 1.5k under the same slight acceleration. It is so minute, it's hard to watch for and watch the road at the same time. What ever the cause, it has not been directly addressed. Maybe it's only in my mind now. Otherwise, the truck is fast, smooth and quiet.